The deadly terrorist attack on the Bardo museum in Tunisia on March 18 turned the global spotlight on this North African nation, which has made significant strides in consolidating democracy since its long-serving ruler, Zine El Abidine Ben Ali, was ousted from power in January 2011. Noureddine Jebnoun, a professor of North Africa Studies at the Africa Center for Strategic Studies, assesses the significance of these attacks and their implications for Tunisia’s security and democratic transition. 1. The Islamic State, or ISIS, the terrorist organization based in Syria and Iraq has claimed responsibility for the Tunis attack. What is this group attempting to achieve with this action? It is still early to confirm the authenticity of these assertions. We should also note that none of the radical Islamic groups active in Tunisia, the Uqba Ibn Na’afa group operating in Mount Chaabmi in the west or the banned Ansar Al Sharia, have pledged allegiance to ISIS. Nevertheless given the very young ages of the assailants, they must have been given clear instructions about the targets, location and timing and were no doubt equipped and trained accordingly. Attacking foreigners, mainly tourists, is calculated at harming the country’s national economy where tourism accounts for almost 7 percent of GDP, 20 percent of foreign currency reserves, and employs more than 400,000 people. The target of these attacks, Bardo museum, is highly symbolic given that it houses one of the world’s greatest collections of ancient mosaics. ISIS has attacked and desecrated historically significant sites elsewhere including in Syria and Iraq. I should also note that this important museum is next to the Tunisian parliament, another highly symbolic institution for Tunisians that reflects their commitment to democracy and inclusiveness. 2. Does this attack have any implications for Tunisia’s democratic transition? To answer this question we need to go back to the 2014 legislative and presidential elections. Tunisia in the aftermath of these elections was successful in building an inclusive and broad-based coalition government that was able to overcome the polarity between the Islamists and anti–Islamists, which characterized the political process immediately after the fall of Ben Ali. What this attack on Bardo has done is brought back the tense atmosphere of this period. The secularists/leftist/liberal blocs allege that the Islamist Ennahda (Renaissance) party is partly responsible for the attacks because of its perceived failure to contain the growing radicalism among Tunisian youth during its past two years in office. On balance these accusations are rather harsh. Ennahda has undoubtedly made mistakes such as its failure to address the country’s socioeconomic challenges but it made major concessions that have helped move the country forward such as abandoning references to Islamic law in the new constitution and the unprecedented step it took in 2013 to allow a caretaker government to run the country in an effort to avoid further polarization. The spirit and culture of compromise that these actions fostered will likely suffer as a result of the attack on Bardo. Should that happen, the coherence of the ruling national coalition might collapse and in its wake strengthen hardliners and former regime loyalists. This group of politicians may well nurture and capitalize on anti-Ennahda sentiment to justify the return of a robust security state which could further undermine the democratic momentum. 3. What explains the fact that Tunisia, despite its democratic gains, is a major source of fighters traveling to Syria? The figure of 3,000 given by many is not easily verifiable but it is undeniable that the number of Tunisians in ISIS is substantial. Three issues should be stressed to better understand the departure of young Tunisians to Syria and Iraq. First, Tunisia has a large, young, and educated but unemployed and underemployed population. Social and economic deprivation, marginalization, discrimination, and alienation combined with widespread corruption and lack of justice play a very important role in the process of radicalization. This reservoir of disaffected youth is a primary source for recruitment into radical groups. The larger policy issue to bear in mind is that the socioeconomic conditions that paved the way for the popular uprising against Ben Ali are still present. 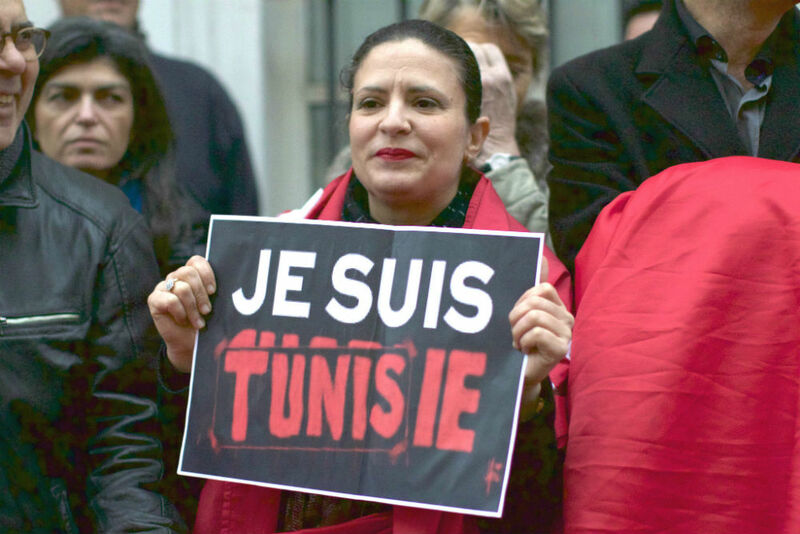 Second, Tunisia suffers from a legacy of religiously motivated violence that is rooted in decades of authoritarian rule. Radical expressions of religion became the outlet for frustration which built up over the years, especially among the youth. Instead of addressing this danger, the fallen regime instrumentalized religious radicalism to assure the government’s longevity. This only created an environment where extremism could fester. Third Tunisia, unlike other countries in North Africa and the Sahel, does not have ill-governed spaces where insurgencies are able to spread beyond the reach of central authorities. Thus, young Tunisians have to leave the country to join external movements; they cannot easily entrench themselves in the country. Finally, we need to closely watch the situation unfolding in Libya because it has serious implications for Tunisia. The troubles in Libya are a magnet for Tunisian youth seeking to join ISIS. Given the absence of effective authorities, Libya has become an important front for this group. Being closer to Tunisia, Libya is a preferable destination to some who might not want to make the longer and riskier journey to Syria and Iraq. 4. What can you say about the growing concern that these fighters might make their way back into Tunisia? The Tunisian government has mostly arrested and tried Tunisians returning from the Levant. In addition to law enforcement, however, there is a need for de- radicalization through rehabilitation and reintegration and these processes should go hand in hand with restoring trust between state institutions and their citizens and between the central authorities and disadvantaged areas. In addition, greater accountability with regard to the rule of law, safeguarding human rights, and empowering youth is needed. The key policy issue is that the deeply rooted feelings of marginalization and exclusion in Tunisia, in particular among the youth, need to be mitigated. 5. What immediate steps need to be taken in the wake of these attacks? These attacks have coincided with the unfolding debate on a new antiterrorism law. Although this law differs from the one used by the previous regime to muzzle political dissents, some key elements remain. What this attack might do is tip the balance in favor of lawmakers who support a security-centric approach over a more holistic and integrated one that can address the root causes of violence in Tunisia. Restricting civil liberties and civil society space in the name of security could create the conditions of repression that would fuel more violence. The Tunisian government, in its response to the attacks, has deployed the army in major cities. This will put the army in direct contact with citizens in urban areas. The legal framework for these deployments as well as their missions and rules of engagement must be carefully clarified in order to mitigate unintended consequences. Sadly, counterterrorism measures, however well-intentioned, often blur the lines between security requirements and fundamental rights. Because of its fault lines, Tunisia can ill afford this. Noureddine Jebnoun, “Tunisia at the Crossroads: An Interview with Sheikh Rachid al-Ghannouchi,” ACMCU Occasional Papers, School of Foreign Service, Georgetown University, 2014. Noureddine Jebnoun, “Security and the Tunisian Constitution,” MEI Analysis, 2014. Terje Østebø, “Islamic Militancy in Africa,” Africa Security Brief #23, Africa Center for Strategic Studies, 2012. Noureddine Jebnoun, “Tunisia Caught Between Fear and Instability,” Al Jazeera Op-Ed, 2014.